(from left) - Rob Bernath, business development manager at the UCF Office of Technology Transfer, and Jayan Thomas, UCF researcher, accept the R&D 100 Award honoring excellence in technology innovations at the annual awards banquet in Las Vegas. 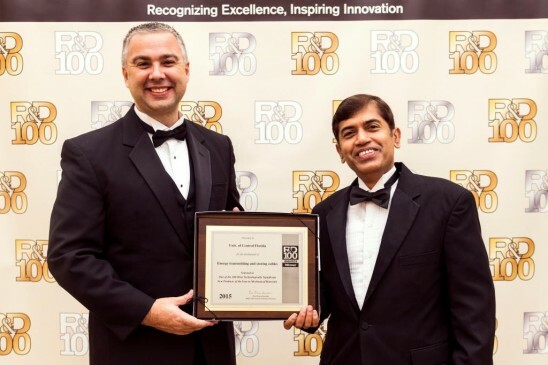 (from left) – Rob Bernath, business development manager at the UCF Office of Technology Transfer, and Jayan Thomas, UCF researcher, accept the R&D 100 Award honoring excellence in technology innovations at the annual awards banquet in Las Vegas. R&D Magazine recognized UCF and Jayan Thomas, at its annual R&D 100 Awards. Widely known as the “Oscars of Invention,” the prestigious R&D 100 Awards have a 50+ year history of honoring excellence in technology innovations. The award, which identifies and celebrates the top technology products of the year, highlighted the work of UCF associate professor Thomas, NanoScience Technology Center, CREOL and the College of Engineering and Computer Science, for his development of energy transmitting and storing copper wire. The award provides a mark of excellence known to industry, government, and consumers that tells potential customers that the product has successfully competed against other new technologies in open competition. Annually, the R&D Awards judging panel screens a sizable body of candidates to determine the finalists from the most innovative inventions of the previous year based on a formal entry. The 100 winners are announced at the annual event, which honors the high rollers of the science and technology industry on stage for their innovative, high-tech products and processes that are, or will, make a difference in our everyday lives. This year’s R&D 100 Awards banquet took place earlier last month in Las Vegas. Thomas’ energy transmitting/storing cable technology was recognized among the 100 winners in the Mechanical/Materials category. The motivation for the technology came to Thomas more than a year ago when he discovered some stray cables lying about while on a walk one evening. He had taken a stroll to ponder the subject of energy storage and in a burst of inspiration, a novel thought occurred to him: Cables transmit energy, but why can’t they also store it? Thomas and his researchers, including UCF graduate student Zenan Yu, focused on the core of the copper wire. They found that growing billions of nanowhiskers on the surface of the core, multiplies the total area and turns the wire into a dual-purpose (transmitting and storing) cable. Increasing the surface area via the nanowhiskers allows the wire to act like a battery—creating energy inside and storing it on the outside. This new electrical cable can replace conventional supercapacitors when it is used in place of standard, non-energy-storing wires. Past winners have included sophisticated testing equipment, innovative new materials, chemistry breakthroughs, biomedical products, consumer items and high-energy physics. The R&D 100 Awards spans industry, academia and government-sponsored research. Last year, UCF—together with NASA Kennedy Space Center, HySense Technology, an early-stage startup company—received an R&D 100 Award for developing a chemically sensitive tape that changes color in the presence of dangerous hydrogen leaks. Thomas also was the recipient of the National Science Foundation Career Award in 2014, UCF’s 2014 Excellence in Research Award, and the Veeco Award for Best Nanotechnology Innovation in 2010. Two-minute video from Inside Science TV illustrating this groundbreaking technology: video link.